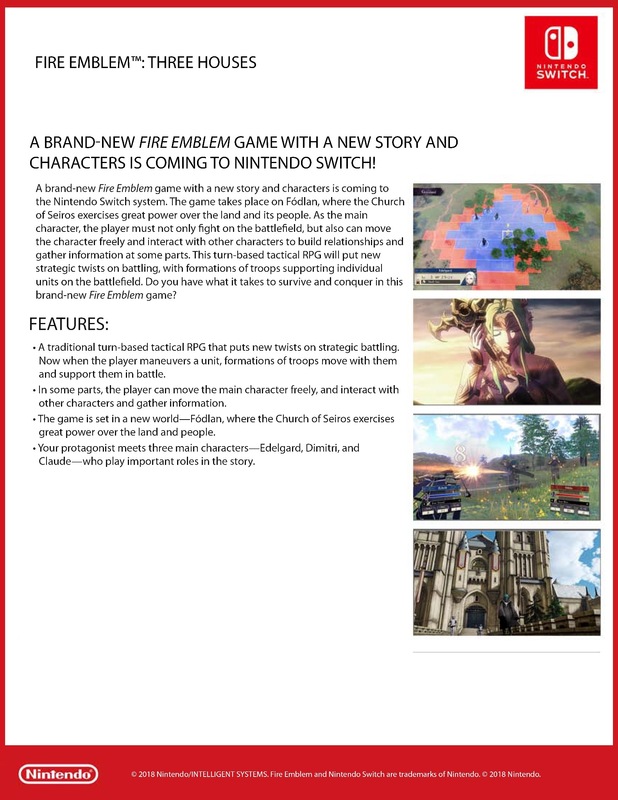 In today's E3 Direct presentation, Nintendo has finally revealed Fire Emblem: Three Houses for Nintendo Switch, which is set to launch in Spring 2019. The debut trailer shows our first look at a console Fire Emblem title in ten years, and we see quite a few dramatic improvements to the game's visuals and systems. Not only does the footage show the SRPG combat we expect to see with this franchise, but also the addition of troop formation and a 3D explorable castle town. The player can also build relationships with your army units, and influence their skills. Find the trailer, fact sheet, and screenshots below. The game is set in a new world—Fodlan, where the Church of Seiros exercises great power over the land and people. Looks good. I've never played a Fire Emblem but might get to it next after I'm done with Ocarina of Time. Wasn't sure if it was worth playing a really old one or just going with Awakening and Fates. Awakening is a good jump off point. The old ones to me feel antiquated now.